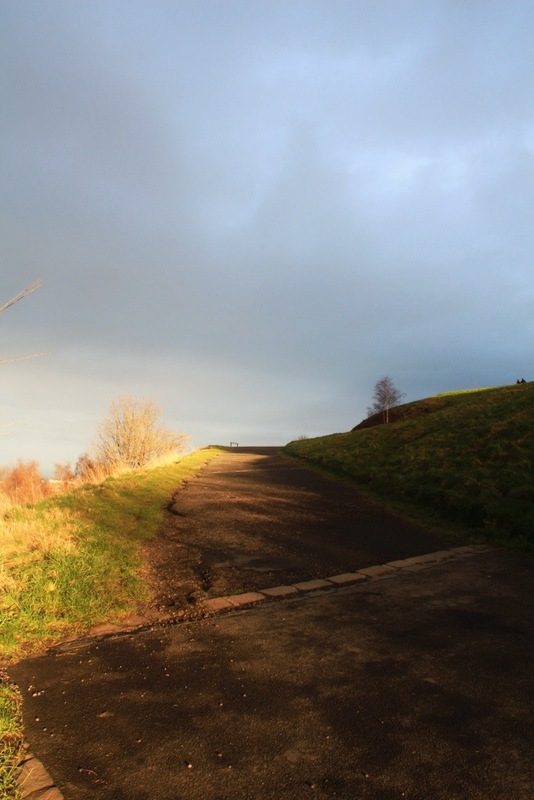 The liquid gold of winter sun pulled us up the slopes of Calton Hill. 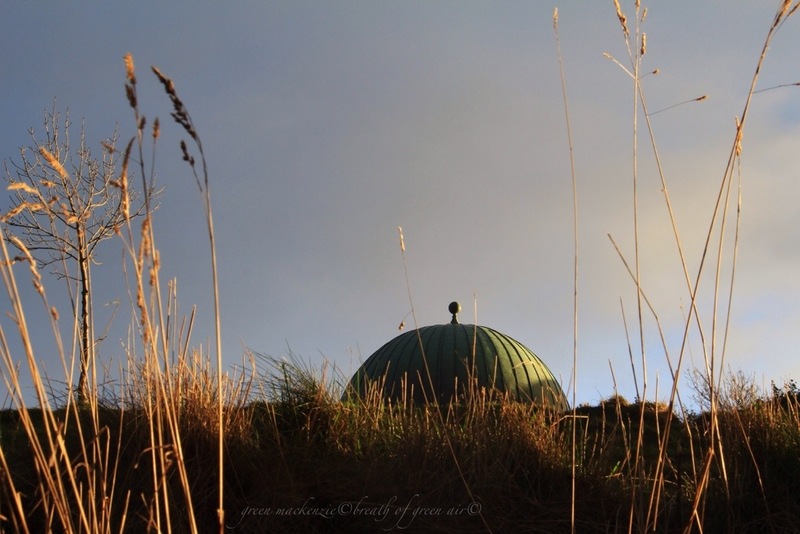 The green copper dome of the old city observatory was closed to the golden sun, but would open its lids to the ocean of stars which would soon follow. A path formed of slanted light and shadow showed the way up and around these ancient slopes. Curling like a snails shell it wound around the hill which rose from the city towards the clouds. 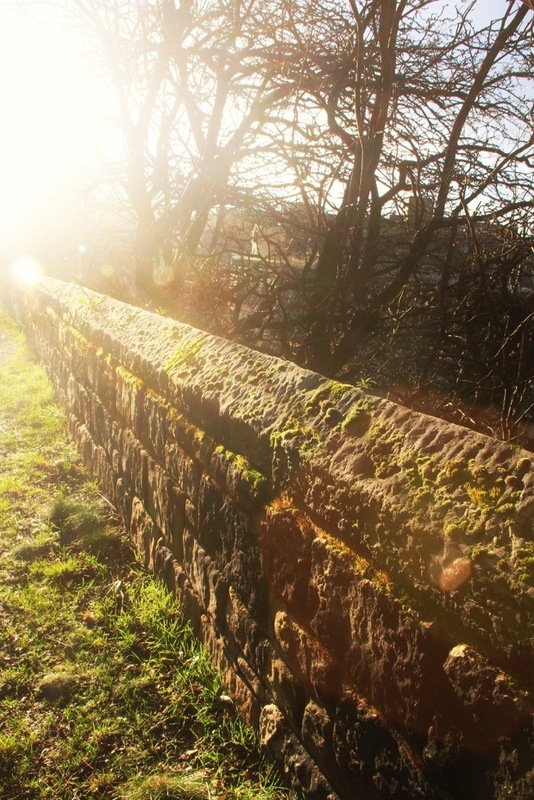 A moss covered wall separated us from the city below, lit by the sinking light of the low winter sun. The Hill of the Hazel Grove has seen the end of countless days. 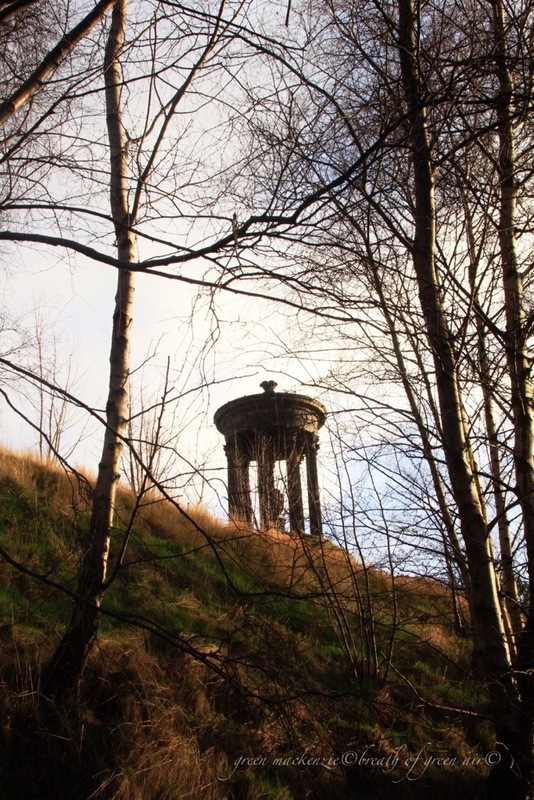 Rising from the slopes above, the vision of an Ancient Greek temple shimmered among the bare branches. It seemed we might have walked into the light and back into times past. 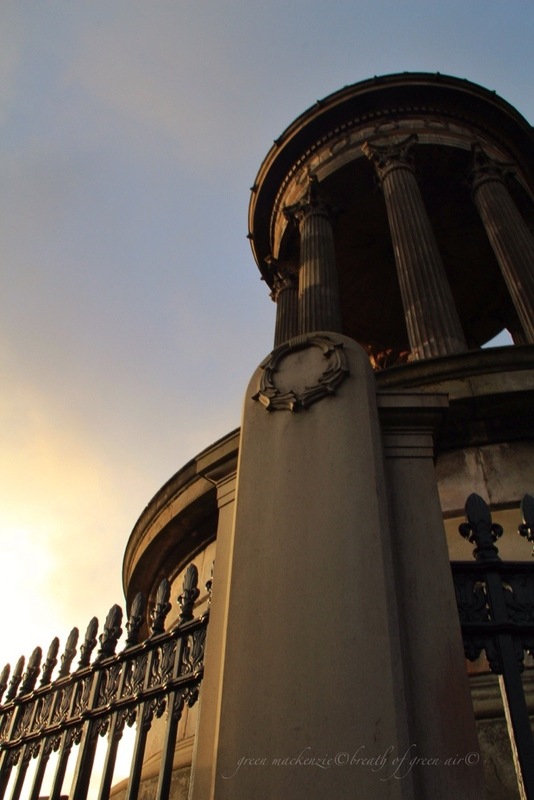 A circular nine pillared temple with views to die for out across the city of Edinburgh. But it was no ancient sacred spot, only a memorial to a philosopher from a few hundred years ago, Dugald Stewart. The light was fading fast and turning to shimmering liquid among the clouds. 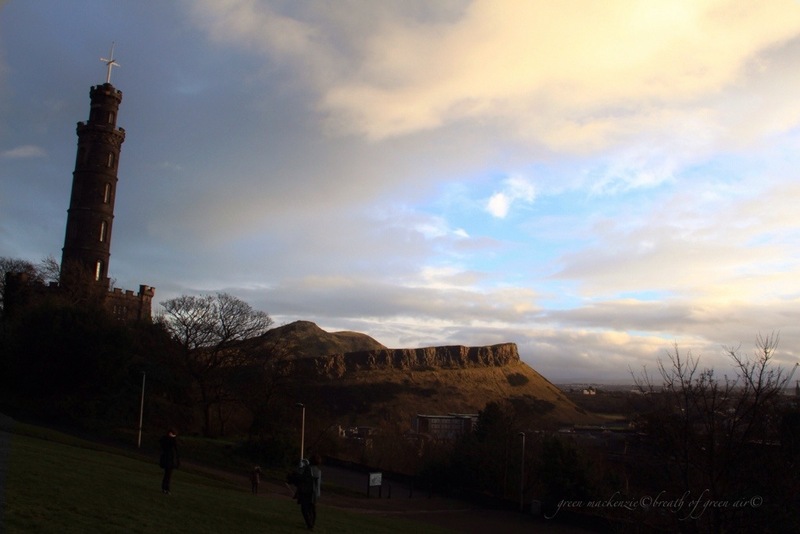 Looking across to the East, Arthurs Seat and Salisbury Crags glowed golden in the low late light. Edinburgh and her hills are so closely woven, the shape of the streets moulded by the rocks which have stood watching, unmoving across the years of progress, since glaciers carved this land. Their beauty is timeless and we rested on these slopes, and breathed and watched the light go out of the day, and the stars began to show themselves, as they have done since the earth began. 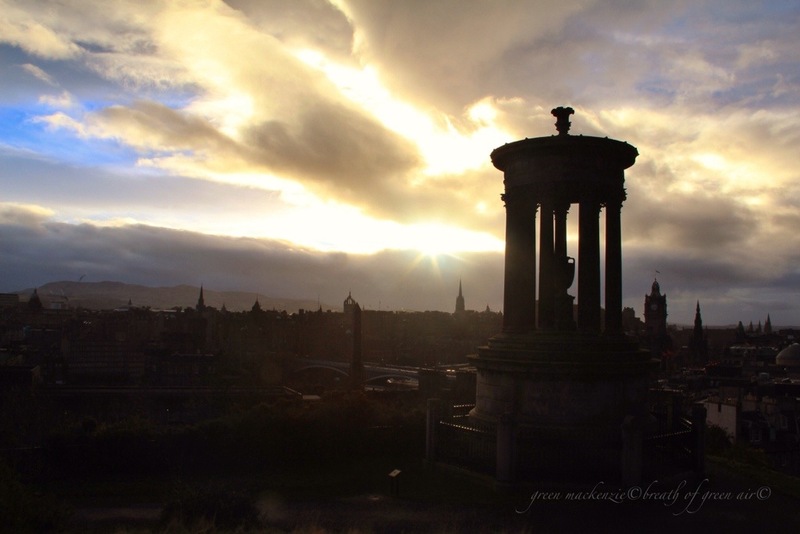 This entry was posted in Edinburgh, elemental, history, mindfulness, nature photo, photos, travel and tagged Calton Hill, history, landscape, mindfulness, photography, scotland, travel, winter. Bookmark the permalink. You’ve taken us on another lovely journey Seonaid, thank you for sharing! So many of the places you feature are places I’ve never heard of so I love traveling them with you! Thank you for taking us on the most lovely of walks. The winter gold is really special! Thank you for take us there. Love the mood you captured here ! Each picture is a poem. Not so sure about the overgrown marrow, but I love all the rest! I love the shot with the setting sun and how the light shines so brightly in the corner. Interesting walk in light and shadow. History is always surprising us, isn’t it. I immeately fell in love with the path of light and shadow. What natural colours and the brown feels like suade. Wow lighting and colour, excellent work.